How long does it take to close a deal on the phone? Maybe 10 minutes. Maybe 15. Maybe 30. Complex sales will often take multiple phone calls to move people from lead to customer. Or maybe you miss interested potential customers because they don’t like talking on the phone. Consultative sales is one of the most popular selling methods out there, but it takes time. To do consultative sales well, your sales team needs to spend a long time working to understand each customer. What if that process could be automated? Before you wrinkle your nose—you wouldn’t automate every step of the process. There’s a ton of value to having a real person talk to potential customers. But what if the most repetitive portions could be automated? It’s impossible to replace the human touch, and not every sales process is a great candidate for the kind of automation you’re about to see. So far, that’s meant 30 additional sales leads and an 8% decrease in people bouncing off the quotes page. Interactive video (integrated with ActiveCampaign) made all of it possible. How do you know if this kind of sales automation will work for you? Pagely knew that their sales reps were great on the phone. Closing deals on the phone was never the problem. If a potential customer hopped on the phone with Pagely, a strong consultative sales process could often convert them into a customer. Still, Sean Tierney, Director of Sales for Pagely, noticed three things that made him start thinking about automation. A lot of sales calls were repetitive. In the early stages of the funnel, sales reps were walking through a standard boilerplate pitch over and over (and extracting the same information from the prospect). At later stages, sales calls need to be more personalized. Freeing up time at the top of the funnel would create more time to spend with higher-qualified prospects (and on addressing more interesting questions). Not everyone is ready to talk on the phone. Some people don’t like phone calls. Others aren’t quite ready to talk on the phone. Interested leads were falling out of the funnel early on. But how can you automate a sales call? How can you give people the information they need…while doing the necessary discovery and capturing the information you need to keep selling to them? Sean created a “choose your own adventure” video for the repetitive sections of Pagely’s sales demos. 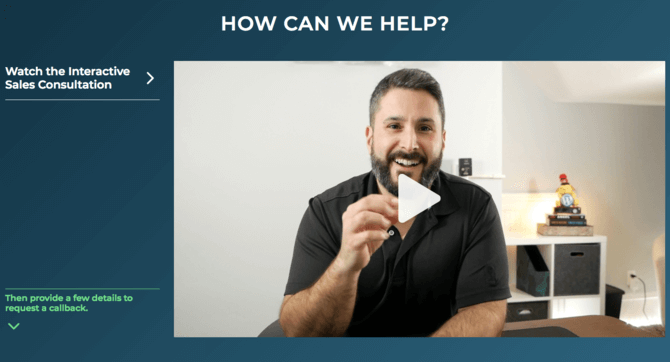 Initially, these consultative sales videos look like any other video. But once the viewer has watched for a few moments, they’ll be asked what they want help with. After people have chosen the answer that applies to them, the sales consultation continues. But now it’s customized based on the answers they’ve provided. The best part? All of that information gets pulled into ActiveCampaign and used to trigger highly-personalized follow-up—before a live rep ever connects with the prospect. The viewer’s responses are logged and mapped to the same tags that Sean’s team uses when note-taking on a live sales call—allowing them to make use of the 80+ personalized follow-up automations previously used for follow-up after a live call. Integrating ActiveCampaign with Dot let Sean create a personalized experience in realtime and after the fact using ActiveCampaign’s tagging and automation features. When sales reps do get on the phone with these new contacts, they’ll have more background information about industries and specific challenges—and the prospects will have received a few highly-targeted case studies (heating them up further based on their responses during the video consult). Sean sat down with Dot to give a detailed account of how to set up this kind of interactive, personalized video. Setting up self-serve video content had fast results—30 more sales leads and an 8% lower bounce rate on the quotes page. What does that mean? It means that there are more people for sales to follow up with—and that fewer people leave Pagely’s website without getting in touch. Even better, the new leads that do get in touch with sales have already gone through the beginning of the sales process (and are therefore more qualified). You can see the interactive video consultation here—and start thinking about how you might be able to add automation to your own sales process.